My teenage daughter was disgusted. All her life she’s been told that Jesus was born in a stable. And then I come back from a trip to Israel earlier this year and break the news that he was almost certainly born in a cave. This is obvious when you visit Bethlehem. Every building is constructed on the side of a steep valley and underneath each building is a cave or grotto where animals would have been kept. 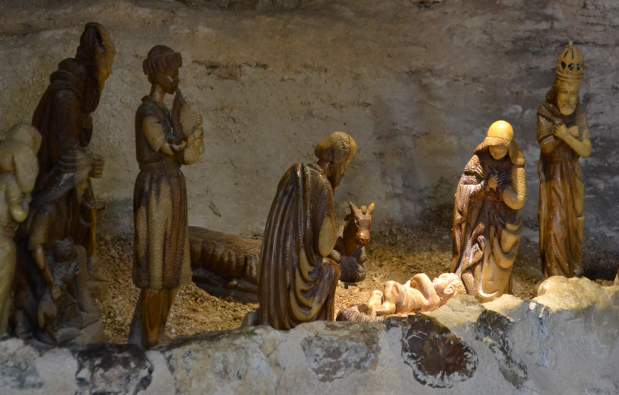 The spot that is venerated as the birthplace of Christ is an underground grotto beneath the Church of the Nativity. And all pilgrims are taken to the so-called Shepherd’s Fields on the outskirts of the town where there is very little grass and no sign of any sheep but lots of rocky outcrops. The photo is taken in one of the many caves. Stables were simply not needed. probably not something to get uptight about. But there is a serious point about imagining the scene as realistically as possible. If we sentimentalise the story, and insist on a romantic picture of how it looked, then we will find it harder to make connections with real life. 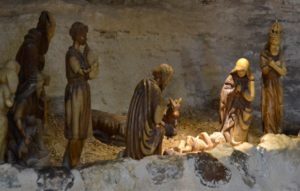 If we try to imagine the harsh realities – of a birth in a smelly, dark cave where the animals were kept – then we might be reminded of the amazing claim that Christmas celebrates: that God entered into our human existence in the toughest of circumstances. It follows that God is to be found in all the trials and tribulations of our lives – in what we might think of as the dark caves that we try to avoid. the dark corners of our hearts, both yours and mine.